This short talk on wisdom – and its relevance in contemporary life – by Dr Stephanie Dowrick begins with a famous teaching from the Wisdom of Solomon. 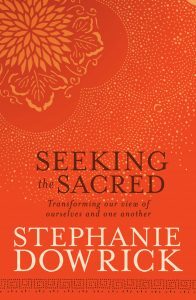 Stephanie uses it as a springboard to invite us to think freshly about wisdom and particularly about the wisdom we learn first-hand: from the experiences of our own lives. To “get” this, she suggests, we also need to think deeply about humility, neither putting ourselves too far up or down, but instead co-operating with our circumstances, causing least harm to ourselves and others, and trusting an instinct for wisdom and compassion that’s part of our human and divine inheritance, but that must be approached and thought about with care. This talk was recorded at the regular monthly Interfaith service at Pitt Street Uniting, Church, Sydney, on 19 May 2013. Your comments are welcome on Stephanie Dowrick’s public Facebook page. Stephanie will also be teaching at greater length on wisdom during the October retreat at Mana Retreat Centre, New Zealand (3-6, 6-9 October 2013.) For details of how to register for this retreat, please contact Mana direct.